Sweep in Peace continues Dina’s story in The Innkeeper Chronicles series, one that borrows elements from science fiction and urban fantasy. Dina owns and operates a sentient Inn that serves as an interplanetary way-station for supernatural beings (and aliens!) and trying to get that illusive star rating all while protecting her neighbourhood from vicious creatures. This WoW is kind of unusual in that the book it features is currently available to read online free…sort of. 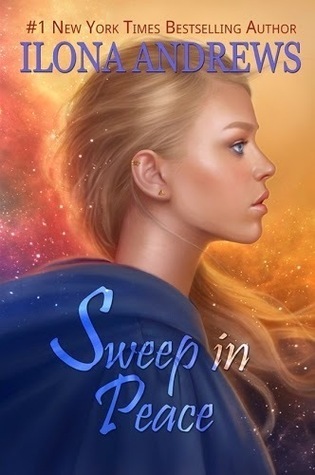 SWEEP IN PEACE is the second book in the Innkeeper Chronicles, an online serial by Ilona Andrews following Dina Demille, keeper of a sentient inn and defender of supernatural creatures…with some unusual abilities of her own. Chapters are published online whenever the writing duo has time in their hectic schedule. There isn’t an official synopsis so the one I included above was written by me! I read the first book in the Innkeeper Chronicles last summer and absolutely adored it, here’s my review if you’re interested in the series. The finished version of SWEEP IN PEACE will be heavily edited for pacing and continuity before it’s released in print, ebook, and audio formats. There isn’t a release date for this one yet, but now that the story has been published online in its entirety I feel comfortable sharing my excitement! Just as an aside: why are the self-published book covers so much nicer than Ilona Andrews’ traditionally published ones? Very peculiar. What are your thoughts on genre mashups like sci-fi and urban fantasy? Have you read any online serials? What do you think of Ilona Andrews’ writing? Inquiring minds want to know! I have to admit I’ve never read a book by her *cringes* But I do love this idea of serializing stories online. How cool! Tammmyyyy! How can that be? I think you’d really like IA’s “Edge Chronicles” series. They’re a unique blend of sci-fi and urban fantasy with each book following a different protagonist. There’s also a strong element of romance. Kate Daniels is also extremely popular, but that series is much slower to start imo. I’ve read the first book of Kate Daniels…and that’s about it, lol! Haven’t had the chance to catch up, though at this point I may just start their other series. I didn’t know they self-published! HA! That’s like IA’s worst book, imo. They’ve done a lot of really interesting stuff with publishing, sometimes I forget just how long they’ve been around. I’d definitely recommend Kate Daniels on audio and Clean Sweep, as well. CS isn’t as polished as their other stuff but it’s so unique! That is interesting how they are releasing chapters as they write them. 🙂 I can’t decide for sure if I would like it or not, but the idea sounds fun. And I have to confess, I’ve not read any Ilona Andrews (yet). One of these days. I know what you mean. I like the idea of an online serial, but personally I am impatient and like having the option to read the whole book at once. 😉 That’s why I’m waiting for this book to be published in its entirety! Ooooh so many Ilona Andrews holdouts in these comments. I’m not sure which of her books would be best for you, since many of them do have a strong romantic aspect that you may not be as into. Probably Kate Daniels (their most popular series) would be best, but you have to read the first and second book to get hooked on the series since book one is just so-so. Yay, more IA fans! 🙂 I loved Clean Sweep because it’s just SO different from anything else I’ve ever read. You really have to hand it to Ilona Andrews, that writing duo has some incredible ideas!